Thanks for the successful Edit-A-Thon! ICANNWiki has over 5,000 articles about companies, organizations, people, and more. This table shows the basic structure of our wiki and teaches you how to navigate it effectively. Discussion Every article on ICANNWiki has a corresponding Discussion page, where you are encouraged to leave comments, discuss changes, and speak to other users. Edit Once you are logged in, clicking the Edit button allows you to contribute to any article on ICANNWiki. Please refer to our Editing Cheatsheet on the previous page for tips! View History Viewing a page’s history allows you to see who previously made edits to a topic and when they did it. Request Account To keep ICANNWiki safe from spam, all user accounts must first be approved by ICANNWiki staff. Simply click on "Request Account" and provide your username and e-mail address, and you will receive an e-mail when your account can be used. We encourage users to use their real names. Search Bar Locate content about companies, organizations, individuals, and more by typing in your search terms. Community Portal A list of the important organizations and companies that support ICANNWiki. 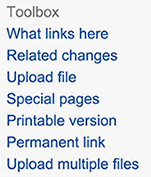 Toolbox This section allows more advanced users to dive deeper into ICANNWiki. Neutral Point of View (NPOV) is the way in which articles on this site and on all wiki sites should be written. That is, wiki articles should not contain any bias or unverifiable facts and opinions. This line can often be hard to define; for example, on our site we often list the services of a given company, but we try to remove any marketing spin or unverifiable language that implies these services accomplish something that their competitors do not. Generally speaking, when opinions are stated as facts, or when unappealing facts are intentionally omitted, then the article is not written from a NPOV. At ICANNWiki, we insist on including references, and generally omit articles and article sections that can not be backed up by at least one verifiable reference. We are constantly editing our articles to better adhere to our Wiki Values and improve their status as neutral articles. When adding or editing content on ICANNWiki, it is important that you use verifiable information with corresponding references. Third-party sources such as multi-stakeholder monitored governance bodies (ISOC, ICANN, IANA) or any other source known for its careful contributions to the subject of Internet governance (CircleID, DN Journal) are helpful, resourceful complements to your work. ICW’s dynamic and rigorous nature can be attributed to the site’s emphasis on original research. Copying and pasting from another encyclopedia or resources does a disservice to your and your reader’s education. While it is okay to reformulate an idea’s concept for your own understanding, it is not okay to closely paraphrase or plagiarize. In the end, go for simplicity and don’t worry about over-explaining a concept. Learn about additional wiki values on ICANNWiki. Be a Builder Strive for quality content, but don’t sweat the small stuff. Corrections can always be made. Wikis are changeable and adaptive. Take a breath and get started. Be Real Professionalism, trust, and community emerge when real people are involved, standing behind their work. Using your real name substantiates your commitment to "transparency" and allows others to better collaborate with you. Using your real name also generates a greater investment in your work. Go With What You Know Writers with passion and knowledge have made ICANNWiki the resource it is today. Believing in your work and approaching an article with a certain studiousness or interest will ensure that at a baseline, your work will be inspired and readworthy. There are no barriers to your participation at ICANNWiki, if you want to build it, go ahead! Hit that edit button! This page was last edited on 22 June 2016, at 15:05.